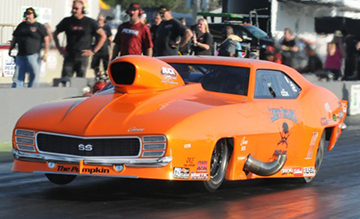 Jay Cox and his Buck-powered “Pumpkin” ’69 Camaro made a strong opening statement in the Flatout Gaskets Nitrous Wars when the local favorite uncorked three of the quickest passes in Pro Nitrous history to win the East Coast Spring Nationals. In the final round against Jason Harris and the “Party Time” ’69 Camaro, Cox left the starting line first and maintained his lead through the finish line, posting a 3.696 at 201.31 mph to beat Harris’s 3.74 at 201.07. Cox’s trip to the winner’s circle started from the No. 2 spot. Through eliminations, he posted an unopposed 3.702 at 201.58 and a 3.677 at 202.09 over Danny Sauro before using a holeshot advantage and 3.664 at 202.52 to take down Lizzy Musi’s 3.658 at 204.98 in the semifinals. Harris qualified in the No. 12 spot and defeated Jim Halsey, Matt Guenther and two-time and defending world champion Tommy Franklin before facing Cox in the final round. The Fuel injection, Ignition and Nitrous systems are all controlled by the EFI Technology XTR ECU and new C1 Ignition System.